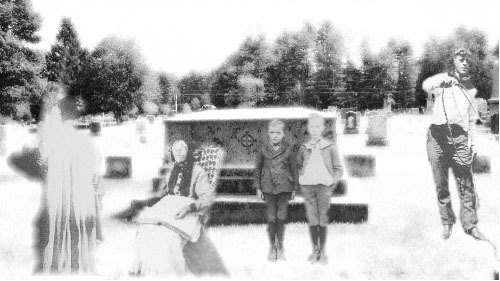 The friends of the Windham NH Historic Commission will be hosting a cemetery walk to benefit Searles School and Chapel on October 11th from 1:00 to 4:00 p.m. Local residents will play the roles of those buried beneath the ground. Among those portrayed will be David Greg who was killed by Indians near Golden Brook in 1740 when he was just nine years old. Tickets are $10 for adults and $3 for children under 18. 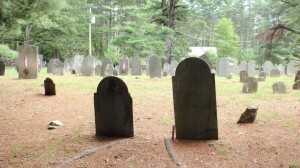 Why not come and find out who lays slumbering in the dust in the Cemetery on the Plain in Windham NH. For those of you who plan upon your death to have your body placed in the cold, still, earth rather than the more free spirited spreading of ashes, the question becomes how will you mark your grave? Today people have their faces and their Harley's etched on their head stones. In the past, the historic stones have reflected the inevitability of death and how best to approach it. Many years ago, before I was married, my wife and her cousin Sue Alosky stopped by my house after they had just walked through the "old" Cemetery on the Plain. They recited the following epitaph to me. "As you pass by remember me, As you are now so once was I, As I am now so you must be, Prepare for death and follow me." "Tis God that lifts our comforts high, Or sinks them in the grave, He gives and blessed be his name, He takes but what he gave." Tis a point I long to know, Oft it causes anxious thought, Do I love the Lord or no, Am I his or not?" "These ashes poor, this little dust, Our father care shall keep, Till the last angel rise and break the long and dreary sleep." "Let all who now behold me here, be faithful till the Lord appears, Farewell dear friends, a short farewell, Till we shall meet again above, I go from you to heaven to dwell, To realize a Saviors love. Though friends and kindred weep around, my body slumbers in the ground, Till the last trumpet shall bid it rise, To meet the Savior in the sky." "From husband torn for friends and family dear, At life's bright moon of death laid her body here, So let it rest from joys and sorrows driven, Till Christ shall call her sleeping dust to heaven." "Forgive, blest shade, the tributary tear that mourns thy exit from a world like this, Forgive the wish that would have kept thee here, And stayed thy progress to the seats of bliss"
NEW DATE!!!!! So see you on October 11th...there is no telling what you might find among the stones.